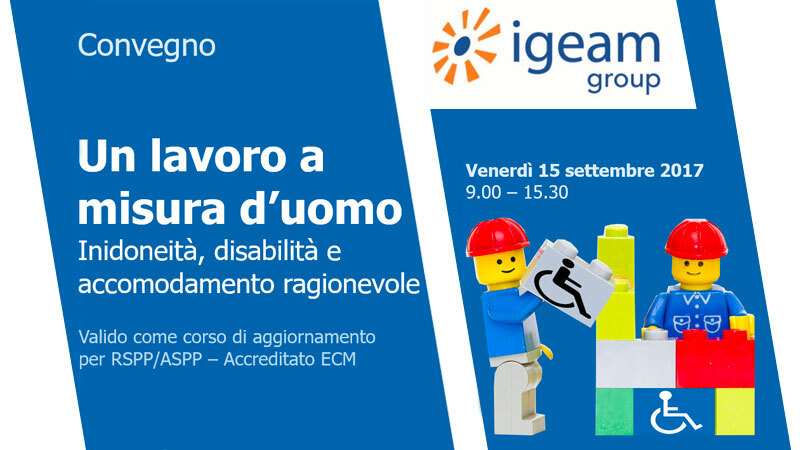 The Igeam Group has organized a conference entitled “Un lavoro a misura d’uomo. Inidoneità, disabilità e accomodamento ragionevole” in Rome on Friday 15th September 2017. One of the most important topics discussed during the conference was the implications of reasonable accommodation for workers and employers. The working population in western countries is getting older and works much longer. Today the most common work-related diseases are strictly related to both occupational activity and lifestyles. Health surveillance of workers exposed to health risks too often results in judgment of fitness/unfitness for work (“fit with restrictions” or “conditionally fit (temporarily, permanently)”. Occupational medicine is the branch of medicine which is aimed to adapt work to man, with the aim to enhance professional skills, social role, and talent. Conversely, a worker who cannot successfully return to work represents always a defeat for occupational medicine. How to face up to these problems that result in organizational and legal difficulties as well as an increase in costs, without any real benefit to workers’ health? A useful opportunity for an exchange of views is being given by new legislation for reasonable accommodation for workers with work-related disability. This legislation provides for the allocation of public funds to companies, with the specific purpose to adapt workplace to an employee who has been judged unfit for work due to a work-related injury or an occupational disease. international perspectives on reasonable accommodation.